Thanks guys, I think it's clear now how excited I am about these jeans. Regarding what Horribly said, I do not in anyway intend to push these jeans, I just think that it's such a unique pair that they deserve good documentation. And Horribly, I understand what you mean about these being a bit "kooky" when fresh. But as the below pics illustrate, they become personal quite fast. Sorry, I didn't mean that you sold them in a negative sense. I think you just showed how nice these jeans are in a good way. They really do get better with age too. Keep them rolled, by the way! What do you mean by "keep them rolled"? those jeans are the coolness! what are the advantages for the pockets on the outside rather than inside? btw: Cotton, these are a great pair for you. I think they suit your quirky dress sense very well! Not really for me, but looking forward to seeing them develop. I really like the idea of outside pockets (and the whole wrap around pocket aswell.. hadent really understood how they where designed before). 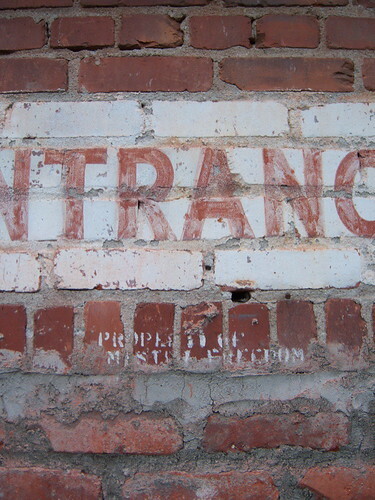 One plus point of outside pockets over inside is that keys and stuff like that doesnt hurt your legs. 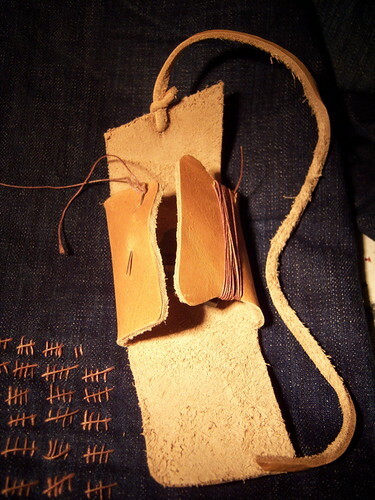 Pocket bags usually isnt as thick as the denim itself. also, external pockets gives it a more workwear-feel, i think? Gave these a 99 days wash, just chucked them in the washingmachine at 40 degrees with black detergent, and drip dry. Took quite a couple of pics with a borrowed camera but they are so bad that I'll spare you those. Did want to show this, left wraparound pocket, carried something around in the back part that eventually ripped through the fabric, decided to patch with some Evis fabric I had. It's interesting how the right side faded much faster than then the left. 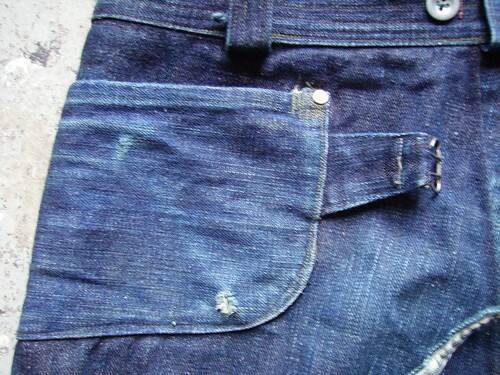 It really shows how much denim matters in fading. 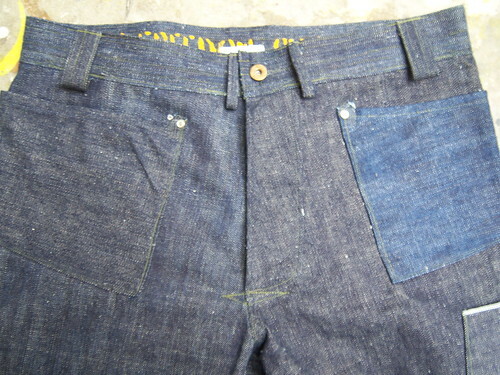 What sugarcane denim is used in the left and right pockets? Is it new denim or is it denim from other models? 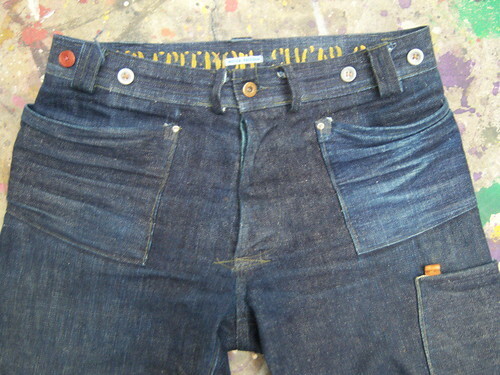 The jeans are constructed from the Okinawa, Hawaii and Edo Ai denim. 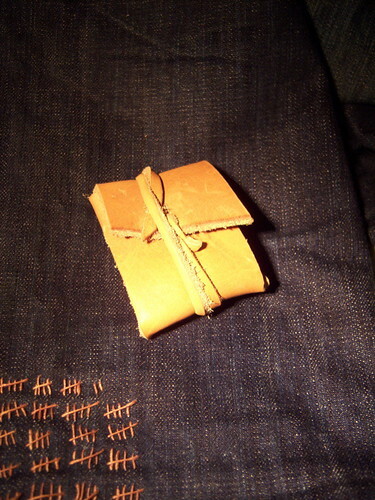 The knee patch, inner part of the button fly and one half of the buckle strap are Edo Ai. Each leg is different but I'm not exactly sure wich is wich (I'll have to ask Mr Freedom) and if I'm not mistaken the left pocket uses the denim of the right leg and vice-versa. 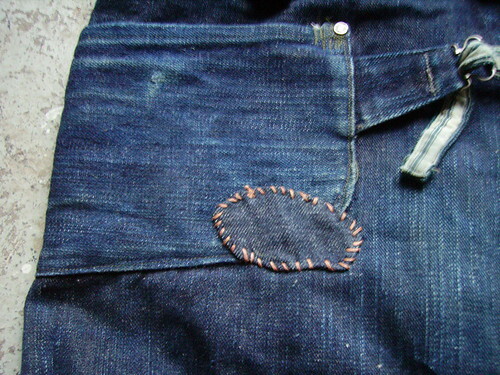 Also the direction of the weave on the pockets and knee patch is horizontal. 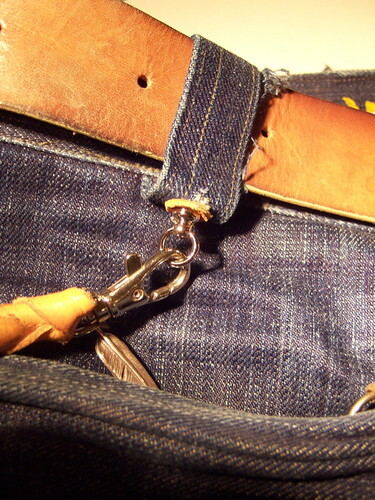 Do take into account that I've been wearing a pouch on my belt on the left side, often with keys attached to it, so that contributed in the fading on that side. Ducky the large-gauge thread goes perfectly with the rough character of the jeans. great stuff. I second that completely. Though I wonder if its just a beautiful coincidence, cause I could imagine a lot of people that those jeans would not look so great on. Nice collection! Love the chambray shirt and denim bag. 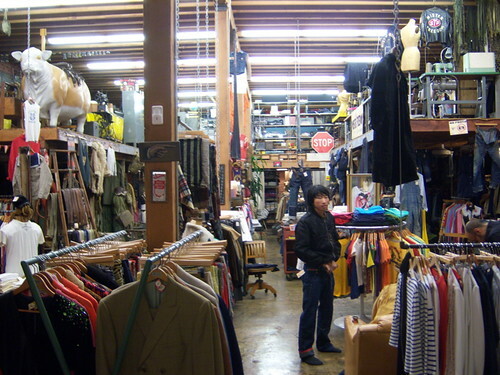 I like the denim deck coat/pea coat, it would be cool if that was also available in a wool fabric as well. Oh my god that jacket is amazing. Where can i get one..
a very well done lookbook--MFSC being the next LVC? Self Edge will be stocking the entire line of Mister Freedom garments.. The items are amazing and beyond words, Christophe has gone beyond anybody's expectations and i'm personally honored to be able to stock his work at my store. I'm so into the jeans, the denim bag, and the denim shirt... I neeeeed them for myself, soon. very soon. im getting really curious about this myself... the lookbook looks excellent. Will the cotton khaki pants be a mr freedom x sc -styled cut aswell, or simpler? Will the denim dungarees be of just one kind of denim this time? looking forward to more pics! I think I threw up a little in my mouth thinking about how much debt I'd have to get into to get this stuff. They going to be made in big people sizes? Come on 20.5" shoulders, 26.5"+ sleeves! 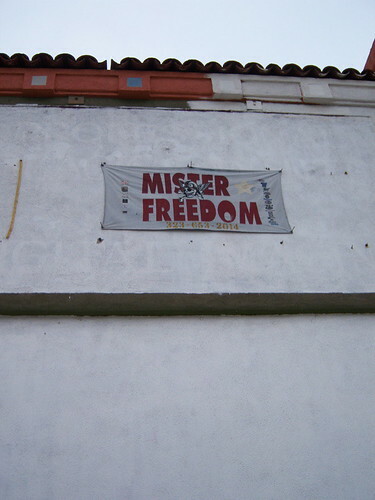 I checked out Mister Freedom on Monday. Not only did I enjoy checking out all the great vintage clothing and boots, but I was fortunate enough to pick up one of the last (two size 40's remain, I believe) pairs of the SCxMisterFreedom's. They are amazing in so many ways, and are definitely something new and interesting for me. I got to see most of the new line, and it looks great as well. It is a nice and refreshing experience to encounter something that has all the vintage elements that comprise the design of these pants while at the same time being completely new and original. 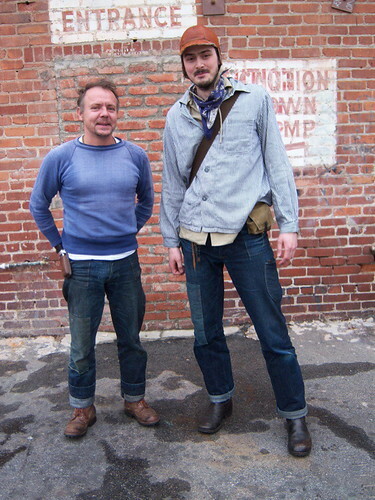 A big thanks to Cotton Duck, Bill, and Christophe, if not for the various pictures in this thread of these jeans working well in a number of different situations, I am not sure I would have had the confidence to pull the trigger on what I think might end up being one of my very favorite pairs of jeans. Congratulations on getting those, you might have to adjust a little to them at first but you'll grow to love them real quick. 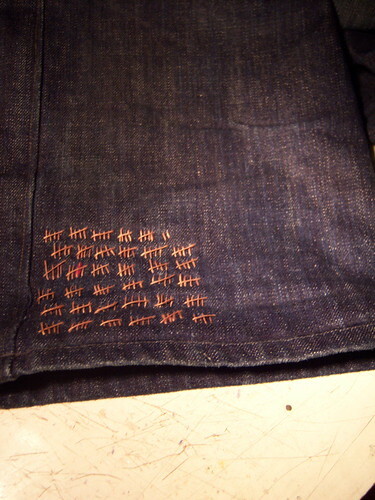 talking to Christophe last week about my jeans I told him that I kept track of the days I've been wearing them. I do it in my diary but he asked if I did it prisonstyle with stripes on the inside. I thought that was a very nice idea, but decided to change it a little. So after a couple of hours catching up, here is the back of my lower right leg. From now on at the end of every day I've worn them I will add a stitch, and to be able to do that properly here's a small sewing kit I quickly made. It goes in my left back pocket.